Having never been to Key West, I figured it was time to find out what it’s all about. So I hoped in my trusty Road Trek (see related articles about this great vehicle here) and headed south. And let me tell you, it is not close to my home base in Kansas City! As you can see from the map below – it was quite a drive. Fortunately, I really enjoy road trips so it was a pleasant journey. I made a few stops along the way, saw some interesting places and caught up with a few friends. 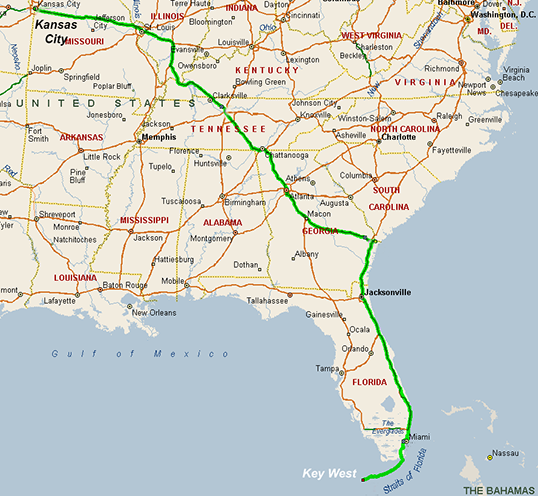 The final approach to Key West takes you south from the Miami area along a niffty stretch of US 1. 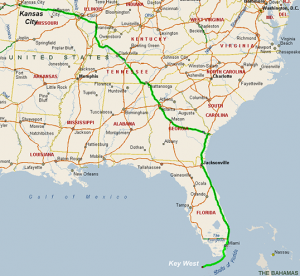 The road meanders from Key Largo to Fiesta Key, Duck Key, Big Pine Key and Sugarloaf Key hop scotching from one to another across an amazing series of long bridges until finally it arrives at Key West. Wonder what to see and do in Key West? Once you arrive in Key West there is an amazing collection of things to see and do. 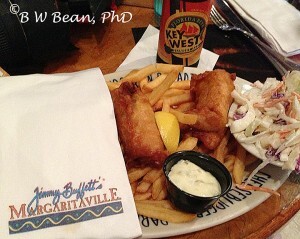 Here is a smattering of ideas, along with accompanying photos, for the Key West Traveler. 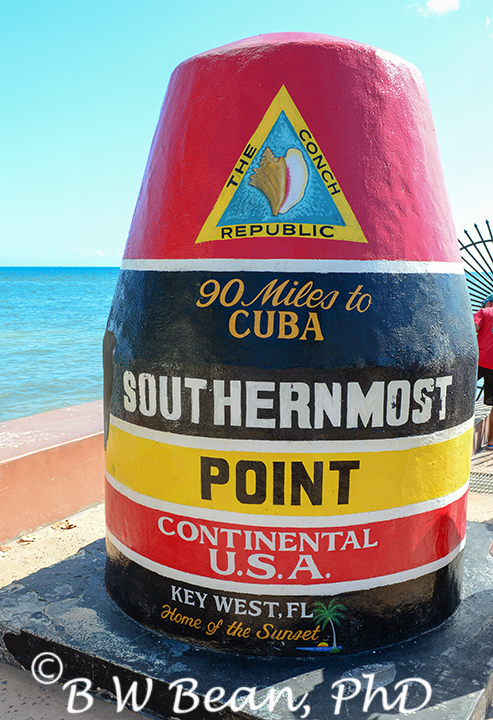 Visit the Southernmost Point of the Continental United States. 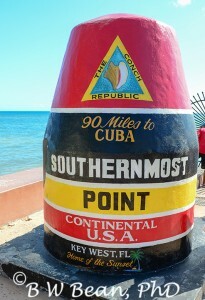 The spot is marked by a gigantic colorful buoy which proclaims it’s strategic location as being on 90 miles from Cuba. Have your picture taken by the buoy. It’s almost a rule that visitors must have this photo! 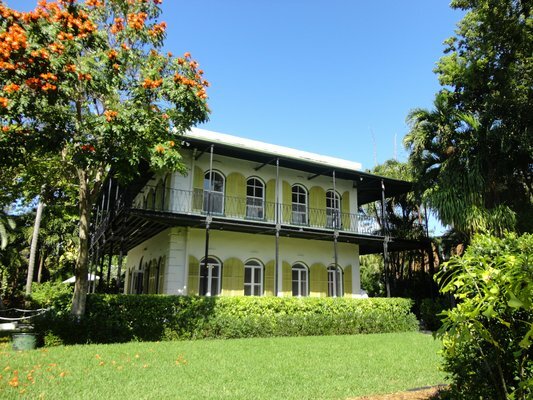 Visit the home of Ernest Hemingway. (hemingwayhome.com) The Hemingway Home in Key West is a National Historic Landmark, Literary Landmark and recorded at the Library of Congress as a Historic American Building. The Noble Prize winning author resided here between 1931 and 1939. You can see where he wrote and also all of those famous “six toed” cats!? By the way – did you know that Hemingway his writing start right here in my home port of Kansas City? Yep – he was a “cub reporter” at the Kansas City Star and some say the Star’s “style sheet” influenced Hemingway’s writing throughout his career. Several of his children were also born in Kansas City. Who knew? 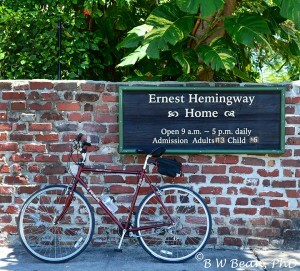 That’s my bike next to the Hemingway Sign. Key West is generally a very bike friendly area and riding a bike is a great way to avoid what can be very heavy traffic on small congested roads. And a big bonus – no parking hassles! To maintain my literary integrity, I must admit that I did not personally visit and inspect the interior of the Hemingway Home. You see, I am not big on architecture and you will note that the admission fee is $13.00. All things considered, I decided that for me at least, the $13.00 could be better spent at my next Key West Destination listed directly below. 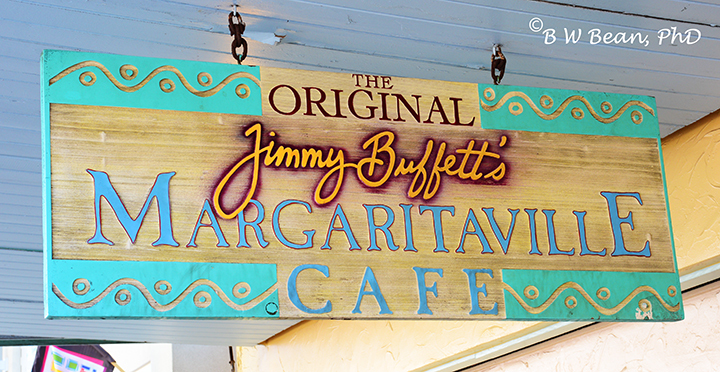 Welcome to Jimmy Buffett’s Margaritaville! The “Original” no less. 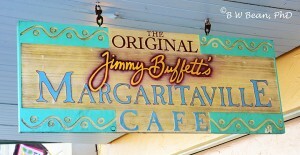 (margaritaville.com) Located at 500 Duval Street, this is the place to enjoy some of that special Key West ambiance. Live music along with great food and drinks. Welcome to Margaritaville Baby! – after all – It’s Five O’CLock Somewhere! Margarittaville seemed like a great place to grab a bite to eat. I went with the fish and chips (fresh local fish of course) and slaked my thirst with a local brew – Key West beer. You can’t get much more Key West that that! Visit The End Of The Road …………. And Enjoy The Adventure! This entry was posted in General Photography and Travel, Travel, Travel & PhotoReport, Travel Tips and tagged Florida, Hemingway, Key West, Margaritaville, RoadTrek by Bruce W Bean, Ph.D. Bookmark the permalink.